Go green -- like Kermit -- with these reusable cup cozies. 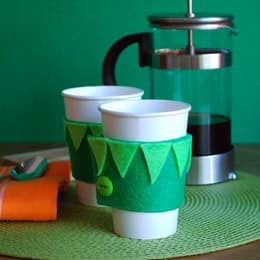 Instead of using a disposable cardboard liner for your drink, craft a cozy from green felt and trim it with Kermit's collar. This craft makes a great gift, and it's a great reminder that, with Kermit around, it's easy being green! 1. First, print and cut out the cup cuff template. 2. Trace the template onto both the kelly green felt and the stiffened kelly green felt. Cut the cuff shape from both pieces of felt. 3. Glue the two layers of felt together using a low-temperature glue gun. 4. Lay the cuff down so that the stiffened felt is facing up. This will be the outside of the cuff. 5. Cut small triangles from the bright green felt. Glue the triangles to the top edge of the cuff. 6. Place the hook end of the self-adhesive Velcro circles on the small tab that extends from cuff. The self-adhesive should be enough, but if you want to you can add a dab of hot glue to help secure the Velcro. 7. Fold the cuff so that you can see where the two ends will join. 8. Now place the soft side of the Velcro on the back of the cuff, opposite the tab. 9. Hook the Velcro ends together, creating your cozy. 10. For decoration, glue a green button to the edge of the cuff. Note: This craft is for decorative purposes only. Use caution when handling hot beverages.